We are the unified voice of university hospitals, bringing experts and organisations together to create a national forum. Through it our members share best practice and shape the future of healthcare in the UK. University hospitals are specialty trusts with significant involvement in research and education. Their research puts them at the forefront of developments in care and connections with industry, while their work in education makes them central to providing the future workforce. Offering the widest range of treatments, university hospitals deal with the most difficult problems a patient might have. With an ageing population and new innovations in treatments and practice, healthcare is becoming more complex. In this context the experience and capabilities of university hospitals become more important than ever. The Department of Health has made membership of the University Hospital Association part of the criteria for gaining the status of ‘university hospital trust’. 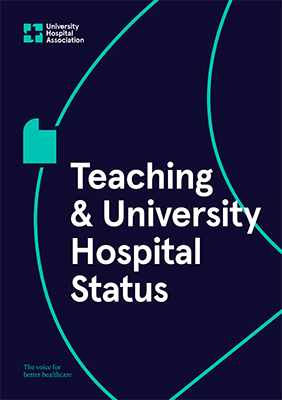 The term ‘teaching hospital’ is also used, but for clarity and consistency UHA and the Department of Health use the term ‘university hospital’. To learn more about the status of university hospitals, see our guide.